It’s St Brigid’s Day, and Danny is teaching Finola how to make a Brigid’s Cross with which to safeguard Nead an Iolair from fire and lightning. When his family and ours lived in Devon, Danny faithfully provided us with a new Brigid’s Cross every year. I always kept the old ones – until they disintegrated: that’s the tradition. Now we have both made our homes in West Cork and it seems appropriate that Danny is still the provider of these essential tokens of protection – which should be placed above the hearth, at the threshold of the byre or in the rafters. There are far more stories told about the Irish Saint Brigid, Brigit, Brighid or Bride than there are about Saint Patrick himself: if I wrote down here everything I have unearthed about her so far I would fill several blogs, so I’m leaving much of it for future instalments. 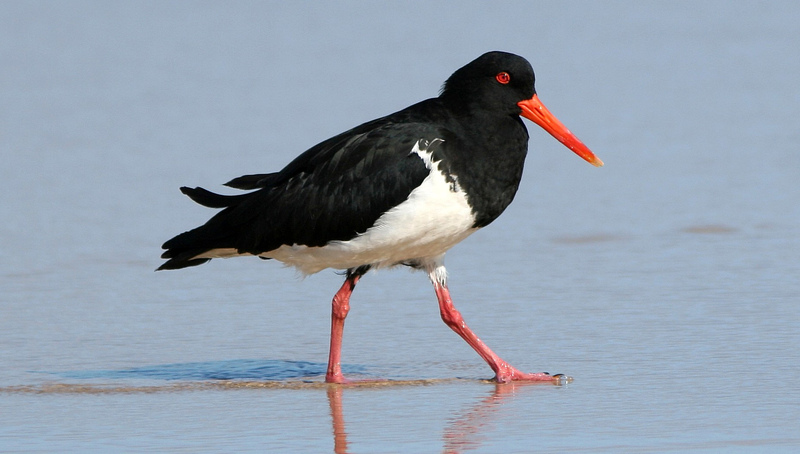 By the way, Giolla Brighde is Irish for Servant of St Brigid and it is a term used to describe the Oystercatcher. The belief is that this bird returns to Irish shores in great numbers on St Brigid’s Day, and is a harbinger of the coming of light and warmth as the days stretch out. Well, in the Cove below us we have seen Oystercatchers throughout the winter: they are spectacular wading birds with a distinctive haunting call. But I do sense that parcels of them have been arriving in the last day or two to ensure that traditions are maintained. So, Ireland’s ‘second’ Patron Saint has also provided us with a little bit of bird lore as a bonus. The Saint’s day – February 1st – is grafted on to the ancient festival of Imbolc, a cross-quarter day seen as the harbinger of Spring. It doesn’t seem much like that today – more strong winds have toppled a fourth tree in our haggart – but there are certainly signs of waking life in the hedgerows, and the daffodil bulbs Finola planted in the autumn are about to burst into bloom. 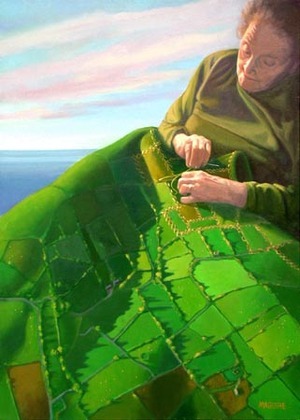 Brigid was expected to visit one’s home at Imbolc. She still does: in some parts of Rural Ireland a tradition has been maintained well into living memory. The Biddy Boys would dress in masks – sometimes of straw – and carry an effigy of Brigid from house to house, collecting money as they went. This custom takes place more in the north now – the rhyme above comes from Fermanagh, although I have found some more local references. Here is an event from Kerry in 1965 – a Biddy Boys competition! The fifth century Saint founded several religious establishments, the principle one being in Kildare (Church of the Oaks). There she petitioned a local chief for some land on which to build her monastery. He was not inclined to provide anything until she asked for only as much as would be covered by her cloak. The chief laughed and readily conceded to this. 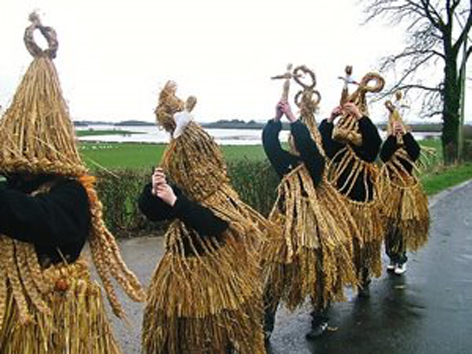 Brigid then handed a corner of her garment to four of her followers and instructed them to keep walking. As they did so, the mantle expanded until it encompassed many acres. 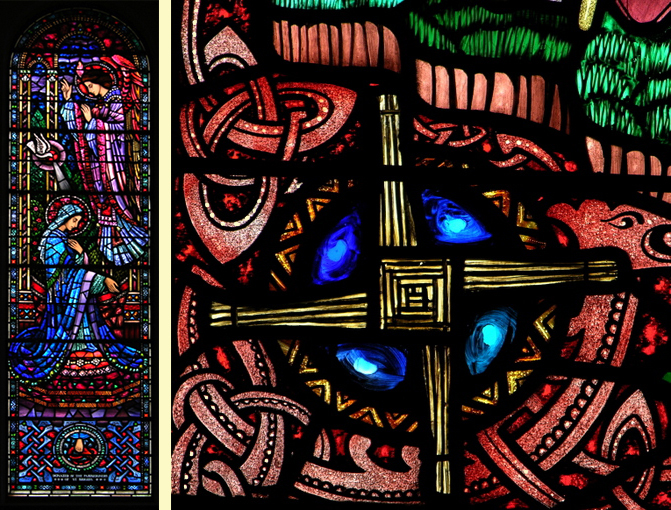 The chief was amazed and duly converted to Christianity; Brigid got her land. The Monastery thrived through seven hundred years after Brigid’s death in 525, and a perpetual flame was kept burning in her honour during all that time. 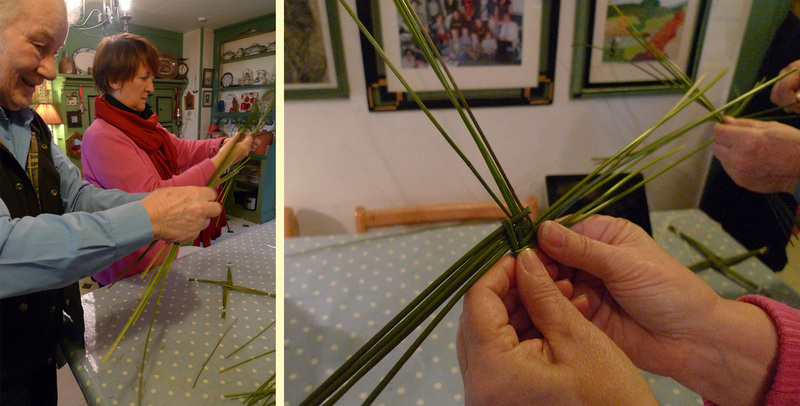 Back to the Brigid’s Crosses: the Saint herself was tending a dying pagan chieftain (some say it was her own father) and began to plait the rushes scattered on the floor into a cross. When the man saw this he wanted to know what the cross symbolised. When she told him he was instantly converted (she was apparently a great converter), and the cross made of rushes has been associated with her ever since. It takes many forms but reappears again and again, especially in rural Ireland. Some say that it represents a sun wheel and shows that Brigid was in fact a Goddess long before Christian times. In 1961 the Irish broadcasting service (which later became known as Raidió Teilifís Éireann) adopted the Saint’s cross as its logo. Appropriately this was suggested by the then Head of Women’s Programming, Edith Cusack. In one form or another it remained the symbol of RTE until the end of the Millennium. In view of all these powerful influences it may be that we should place our St Brigid’s Cross over our television set – to protect us from it! This entry was posted in Folklore, Religion, Roaringwater Bay and tagged Biddy Boys, Biddy Boys Kerry, Eamonn De Valera, Edith Cusack, Fenruary 1st, Giolla Brighde, Imbolc, Oystercatcher, Raidió Teilifís Éireann, RTE, RTE Logo, St Bride, St Brighid, St Brigid, St Brigid's Cloak, St Brigid's Cross, St Brigid's Day, St Brigit. Bookmark the permalink. And another very interesting article in (on?) Roaringwater Journal. Thank you. I did not realize that RTE’s logo is based on St Brigid’s Cross. Fascinating. I wonder wasn’t “lovely dark-haired Edith Cusack” a bit subversive there. 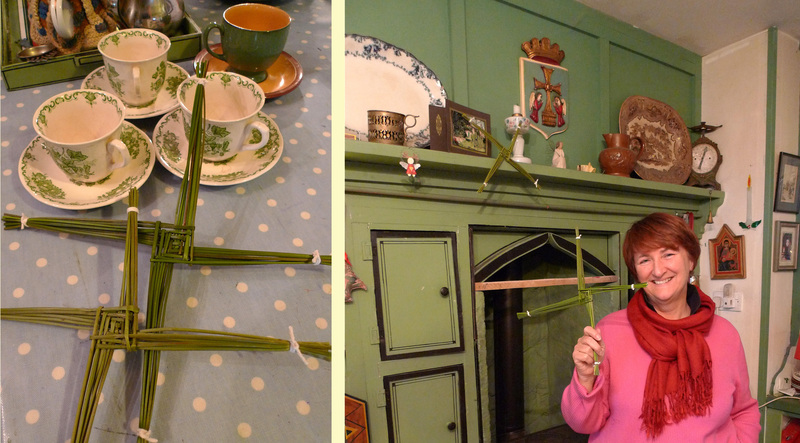 St Brigid’s crosses are fiendishly difficult in my experience – I just coudn’t get the hang of them when we did them in the classroom! I had to get small children to teach me. Interesting about the oyster catchers.